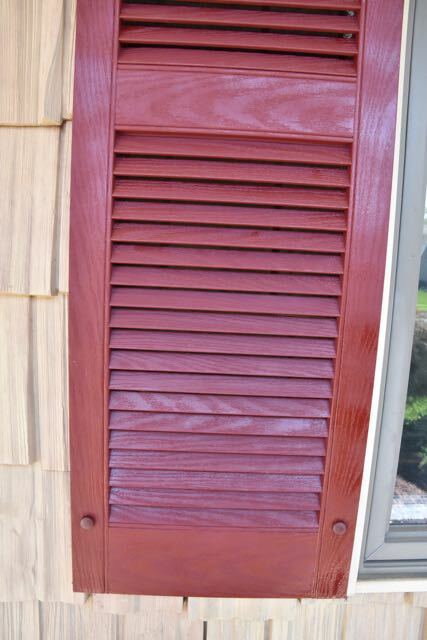 After so many years, my nice burgundy shutters on the front of my home were faded and worn. Made of plastic as most are today, they were attached to my siding with plastic push pins, 4 for each shutter. In addition to looking worn and faded two of them near my trees and bushes were full of wasp nests and I knew I had to pull them down to get rid of the wasps and of course to clean and repaint them. The first step was to spray the sides of the shutters where the wasps were with Wasp and Hornet pesticide to kill any that might have been at home. 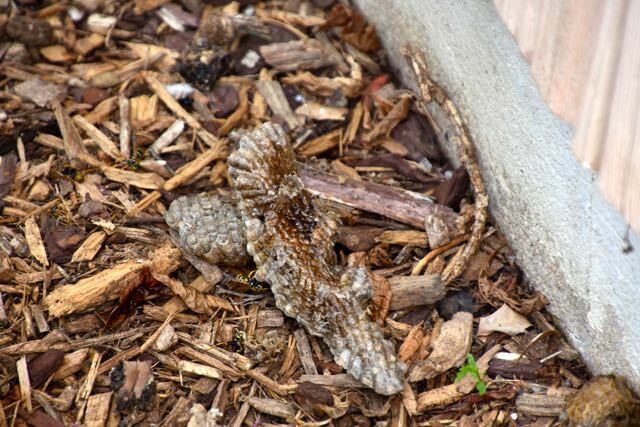 Most experts will tell you to only rid the nests at night when all the wasps are back and sleeping. I wanted to do it when most were out working and not in the nests, less chance to get stung. This way I could pull them down safely and take the next step in making the shutters wasp proof. There were two reasons to take on this project, the first was to clean and paint the shutters and of course the second was to stop the wasps from making them their home. I checked on the internet and there were a number of solutions, so I decided to try one that seemed to make the most sense. I purchased a roll of household fiberglass screening material. I felt this would be easier to work with than the aluminum screening. The idea was to cover the openings in the slats from the back side so the wasps couldn’t fly in. Of course they could get in from the sides, but you will see how I deal with that issue later in this article. I took a sheet rock hand saw to cut the 4 plastic pegs holding each shutter in place. You can use other saws you might have to do this job. Easy to cut the plastic pegs when I was done they came off and a number of wasp nests fell to the ground and were still attached to the back of the shutters. I cleaned the shutters with a solution of liquid soap and a stiff brush and made sure they were totally cleaned of any algae, accumulated dirt and wasp dust. I let them dry before the next step. I have an old plastic tarp I use for a number of projects and spray painting is one of them. I purchased a can of spray paint for just under $4 that can be used on any project including painting plastic. 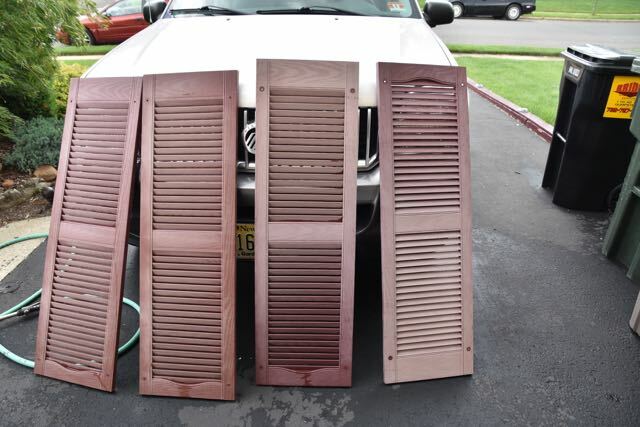 I gave each of the four shutters a nice even first coat. The paint manufacturer suggests applying it in the shade so it dries properly. A second coat was given to each to be sure I covered everything properly. Now that the paint was dry I was ready to take the big step in putting on the screens. 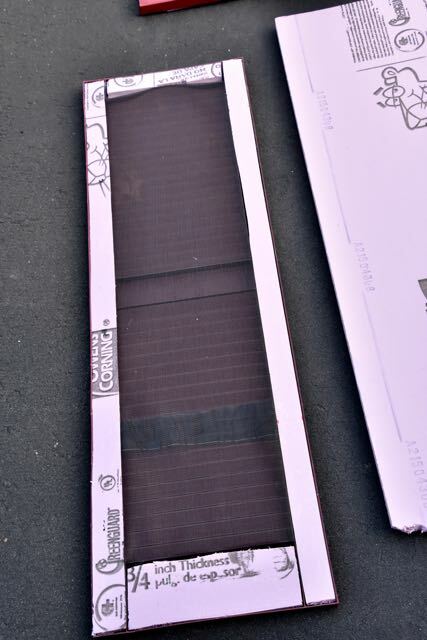 I bought a sheet of Foamular 250 by Owens Corning is comes in a large sheet and is a nice light weight solid insulation board. It is easy to cut with a razor knife and a large straight edge. Cost around $10 for the large sheet. I was going to use this material to lock in the screening and to fill the hollow spaces on the back of the shutters. I measured the width of the channels in the shutters which were 1 3/4″ and cut strips of the Foamular to be used to fit those spaces. On the bottom I needed a 4″ wide piece as you can see in the photos. I cut the screening material approximately 14.5″ wide and on the length used the full 36″ (the width of the roll of material) and I was still about 12″ short for the length I needed. I had to cut another smaller length that I overlapped to make the 48″ length I needed. This worked out fine and I was able to get 4 shutters done with a 36″ X 84″ roll, cost around $10. Now that I had the screening cut and the foam board, I covered the slats (on the back side of course) so the screening overlapped and was in the channels. I purchased a tube of adhesive for foam board that was fast drying and with a caulk gun put dabs of it where I was going to put the foam strips. This plus the tight fit of the foam strips would hold the screen in place. Don’t expect to get a tight screen that you might if you were replacing a screen on a window or door, there is no rubber gasket that goes into a channel to make it tight. You will have to try your best, but it really isn’t that important since the screen is there to prevent the wasps from getting through. 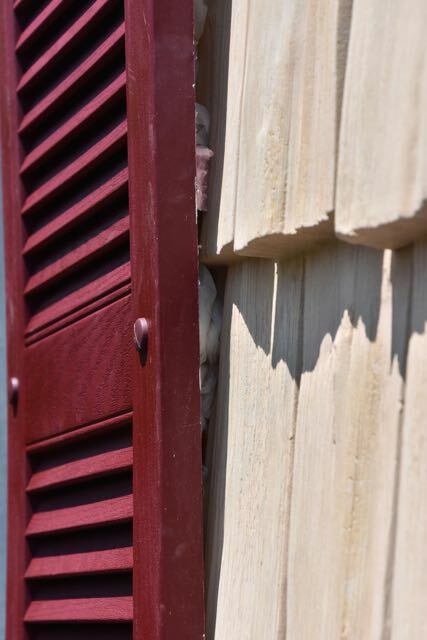 Remember we want to fill the spaces where the wasps will put their nests, which was the shutters channels. The foamcore will take care of that and will also hold the screen in place. 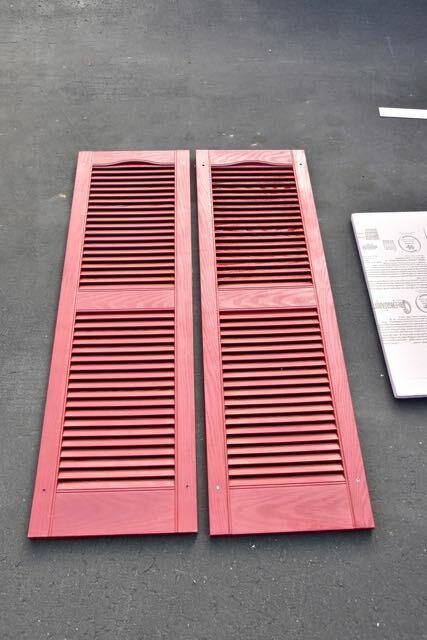 Remember, the screens are there to prevent any insects from getting into the back of your shutters, through the slats. You can see the plugs in place, color was close enough to match. Now the shutters are painted, and wasp proof so they are then reinstalled. I had a number of extra shutter plugs that I was able to use. If you don’t have any, they are available at Home Depot or Lowe’s, 12 plugs cost $9.77 at HD in many colors. I was able to actually get the shutters back into their proper holes. You can do this by marking each shutter as you take them off your house, so you know how they go back up. Mark the back or put a piece of tape on each so you know where they go. If you do this, the holes will match up when reinstalling them. If you don’t, you may have to drill some new holes into your siding, not a problem either way. My wife helped me hold up the shutters as I pushed through the first peg on the top of each shutter. Once the first one was in place the rest went in easy. I did have to drill some of the holes a little deeper, but it worked out fine. These are quite light and easy to work with. To make sure the wasps didn’t try to make their nests in the shutters, I had to take one final step. 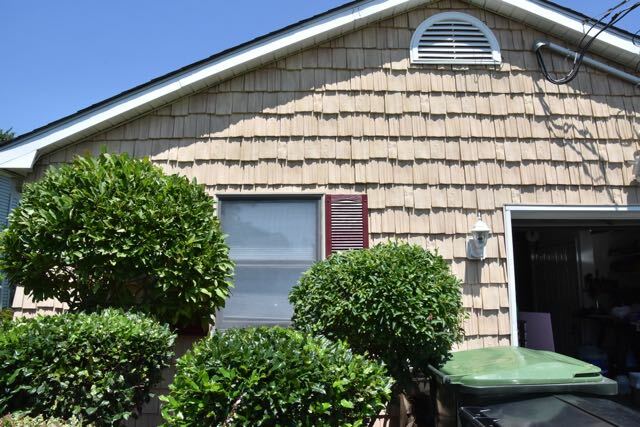 As you can see from the photos I have a shake like vinyl siding on the front of my house. The shutter won’t lay flat and there are opening on the side. I thought I could use expandable foam to fill them, but that is a mess and if I ever had to remove the shutters again it would be impossible. I couldn’t fill it with paper, the rain and snow would make that a mess. I decided to stuff some pieces of the foam board in to fill some of the spaces and then took plastic bags from the market and stuffed those in as well. On the front of the house you really can’t see the shutters much and that is where the wasp problem was so I could leave it like this and be O.K. Another method is to get almond colored caulk and after filling the spaces with the plastic bags use the caulk to top it off…but for now, I won’t bother and will see how it goes. Note: I only filled the one shutter with the plastic bags and later in the day went to the other side to do the same. Wouldn’t you know a wasp flew out as I began to stuff the plastic in the openings. They didn’t waste much time to find a new home. I will plug that side up as well and hopefully they will find other spots in our block to call their home. Here are the tools I used for this project. When taking the shutters down, I had a portion of the plugs in the shutters. If you pull them forward they are hard to remove, so I used a lineman’s pliers to snip the heads off and pulled the remaining plug out of the back. Any pieces left in the siding I was able to bang in with a small hammer and they fell behind the siding. Now the house looks fresh and clean again. The shutters in the new color match our front door and some of the trim around the house. I still have our wasp friends that will find other spots to nest, but at least when I go out of the garage into my car or have to take out the garbage and recycling, I don’t have to deal with the swarms of wasps. 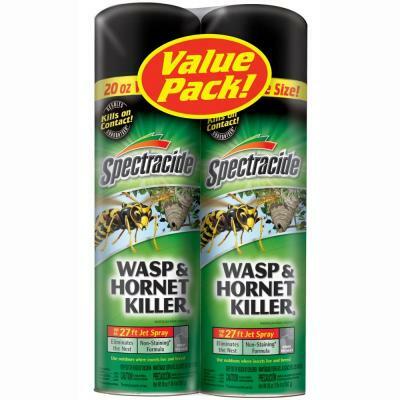 I was able to use the wasp and hornet killer which is a spray by Spectracide because is has a jet that can go up to 27′, so I was able to stay a safe distance away from the wasps. If I saw one flying around, I would hit it with the spray and they drop to the ground and die. It is inexpensive and I bought them last year in a two pack on sale for under $8 on sale at Home Depot. I see they now sell them for $4.88 each. I am the president of the International Press Association and the publisher of IMPress Magazine. As a working photojournalist and videographer, I cover many events in the New York and New Jersey area for our publications. I am looking forward to our newest publication the Hazlet Times that will be a publication meant to showcase the things I love in Hazlet and those that might need some improvements. Great job on the shutters. I’m in the final stages of repainting my forest green vinyl shutters after just finishing power washing the whole house. I had old bees nests behind several of them and I wish there were some chemical I could spray on the back of them to deter nest builders. Follow my instructions and fill the back of the shutters with foamcore you can get at Home Depot and screening so they can’t get in. Then if you want stuff any cracks with foam or I used plastic bags from the super market and then used some caulk over that to seal it against my irregular shaped siding. You don’t want them to have access to the back of the shutters. I only had to do this to the one outside window that had the wasps, the other one on my shaded porch had none. Thank you for sharing your solution!! We just finished the exact same project and are keeping our fingers crossed the wasps stay gone. Do you have any updates to report? The wasps were rather upset and confused when we took the shutters down to wash, paint and perform wasp prevention tactics. ?